Concussion Prescription: A Year On The Bench For Youngsters? : Shots - Health News Young athletes who have two concussions within a year take nearly three times as long to recover as someone experiencing one concussion. A history of past concussions also hurt recovery times. Concussion Prescription: A Year On The Bench For Youngsters? 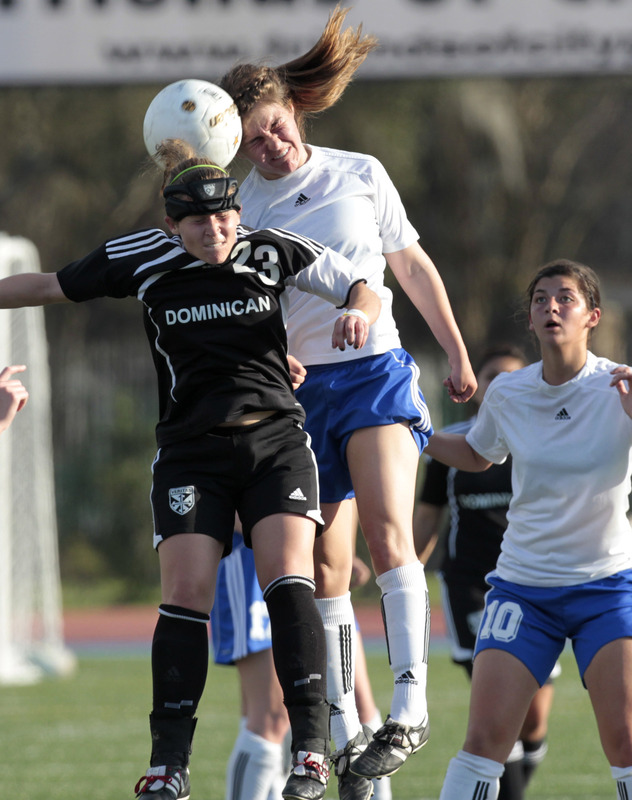 Katherine Cuntz and Sarah Gaudet go up to head the ball during a Louisiana high school championship game in 2011. The moms at Saturday's soccer game let out a collective wow as a 10-year-old girl headed the ball away from the net. Then one next to me said, "Should they be doing that?" Another said, "I don't think so." But none of us yelled: "Hey, kids, no heading the ball!" Head injuries are a big problem for young athletes, who may be more vulnerable for a year after having a concussion, according to research published Monday. That means students and their parents may have to think hard about when it's safe to return to play. "I'm going to guess that lots of parents (perhaps most of them) wouldn't keep their kids out of hockey (or football or lacrosse or other high-risk sport) for a year after a concussion," Dr. Claire McCarthy, a pediatrician at Boston Children's Hospital who wasn't involved in the research, writes in her blog. "They would take the risk." But we still don't know if one year is what it takes to protect kids' brains, says Dr. Matthew Eisenberg, the lead author of the study, who is an emergency room physician at Boston Children's. "We didn't have enough patients to pinpoint the window of vulnerability," Eisenberg tells Shots. "We were nervous about this before, and now we see even more reason to be nervous. But we're not able to say when is the right time to return to activity." The patients who had had a concussion in the year before being injured again had symptoms for almost three times as long as those with a first concussion, 35 days compared to 12 days, according to Eisenberg and his colleagues. The study appears in the journal Pediatrics. They tracked 235 patients, ages 11 to 22, who came to the emergency room at Boston Children's with a concussion. Two-thirds of them were injured playing a sport, with hockey, soccer, football and basketball the most common. They then followed the patients to see how long it took them to recover. Headache and other concussion symptoms can make it impossible for students to do schoolwork. Patients are often told not to read, use computers or watch TV. In the study, those age 13 and over were more likely to have a long recovery time. That could be either because neurobiology changes as children mature, the researchers theorized, or that they are playing harder, with more contact and higher-force impacts. Any athlete suspected of having a concussion should be removed from play immediately, according to guidelines issued earlier this year by the American Academy of Neurology. The goal is to reduce a second hit to a recovering brain. Despite his findings, Eisenberg says he would never tell a parent to keep a child out of sports for a year. "For every family, for every child, the situation is going to be different," he says. "It's really important that they get close follow-up care and make decisions based on what's best for the child."